Fishes we do not immediately associate to dance, or building nests. 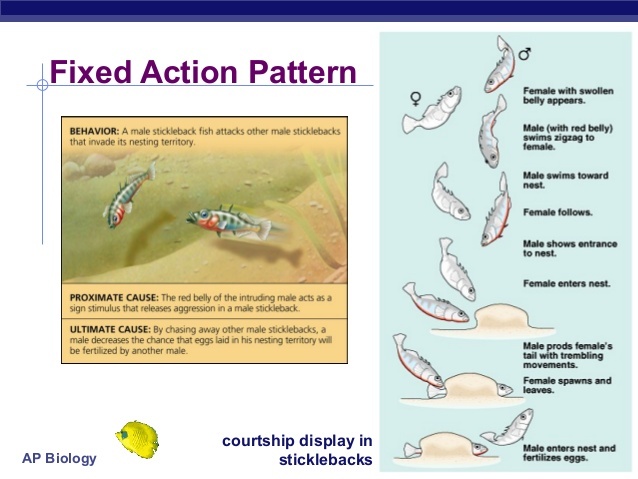 Yet that is what the adult is stickleback doing in our region. It is a small fish (7-9 cm) without scales. The spines form the front of the two dorsal fins. The Gasterosteus aculeatus (three-spined stickleback) migrates in the spring to canals and rivers. Males choose a territory and chases there from the other males who have a "red throat". In the center of his field he usually digs a hole as a base by snapping sand away and spitting it out elsewhere. Then he makes a mat of algae and others plant material that he is gluing together with a sticky secretion of his kidneys. Afterward he drills through it to make a nest in there. Sometimes the nest is also hung in the vegetation. The Dutchman Nico Tinbergen studied the love life of sticklebacks. As the breeding season approaches, the male gets brighter colors and a red belly. He tries to convince one or more females and lure them. If one enters on his property he swims immediately to her and does his rhythmic, ritualistic zigzag dance, dancing back and forth between the nest and the female. He achieves this way that the female gets excited and in the mood to mate. to show the female the way. She squeezes into the nest. Shuddering the male stimulates her to make her leaving her eggs there. Almost immediately after her the male swims through the nest and incubates with his milt moisture the newly laid eggs that are 2mm in diameter. Immediately after this the love is over. The male chases the female as it was an intruder. He guards the nest and the offspring. During the 5-12 day development the male fans them trough the nest. Baby fish leaving the eggs are 4 mm. Their father continues to protect them until they are old enough to leave the nest. In one year, they will grow to 2,5 - 5 cm and migrate to sea to overwinter. From the daintiness of females and their selection of male partners those often owe their distinctive characteristics as color, eyes steal, long drag pies or acrobatic courtship movements. For sticklebacks this is apparently the bright and red color, and the zigzag dance.